Two of the Del Pilar-class ships during maneuvers with a US Navy destroyer. Photo c/o US Navy. The Philippine Navy (PN) reclassified their only class of frigates into offshore patrol vessels, to better reflect their capabilities and purpose. 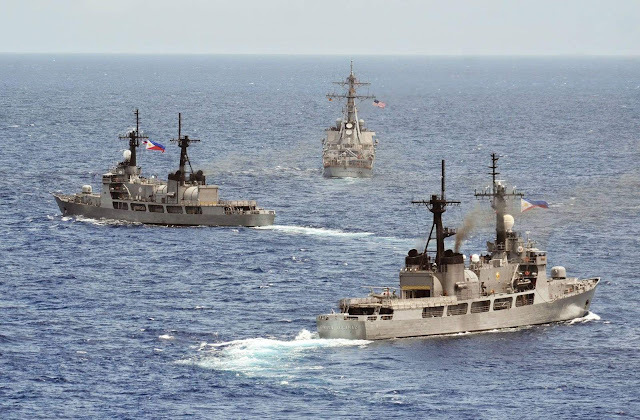 The Del Pilar-class ships, which were in previously US Coast Guard high endurance cutters of the Hamilton-class, were downgraded to offshore patrol vessels due to their lack of capabilities in surface warfare (ASuW), anti-submarine warfare (ASW) and anti-aircraft warfare (AAW). The ships also lack an electronic warfare (EW) capability, which is now becoming standard in modern frigates. The ships of the class are now using a reclassified hull number, with BRP Gregorio del Pilar changed from FF-15 to PS-15, BRP Ramon Alcaraz from FF-16 to PS-16, and BRP Andres Bonifacio from FF-17 to PS-17. In Philippine Navy classification, “PS” is used to identify offshore patrol vessels and corvettes, while “FF” is used to identify frigates. The ships of the class lack the necessary sensors and weapons to allow for combat in medium to high intensity conflicts, although an upgrade program is on the way. In a separate report, the tender for the sensor upgrade for the ships of the class had been completed, although the Department of National Defense (DND) has not formally released information on the winning proponent. The ships are slated to receive a new combat management system, hull mounted sonar, and electronic support measures system from the winning proponent, while also getting a new 3D air/surface search surveillance radar and EO/IR fire control camera acquired from US Foreign Military Sales (FMS) and Foreign Military Financing (FMF) programs. Two of the ships are also scheduled to receive a pair of BAE Systems Mk. 38 Mod.2 25mm machine gun systems acquired also under US FMS program.